Egyptian President Abdel-Fattah El-Sisi said he “doesn’t worry about attempts from the outside to destroy Egypt,” but instead is concerned about attempts from inside the country, in public comments on Friday. 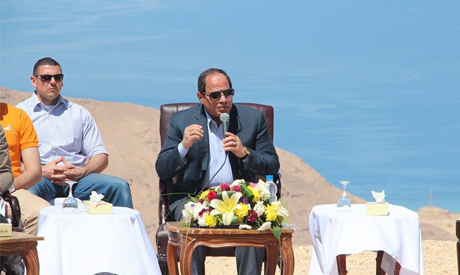 “There’s a hellish scheme [from within] that some may not pay attention to,” El-Sisi said while opening the El-Galala Mountain touristic site on the Red Sea. The project contains housing units suitable for all social classes, as well as a number of touristic areas, along with Abdallah Bin Abdel-Aziz University. Roads will be created to connect the Galala Mountain project with Red Sea resorts. "The cracks that have appeared in [Egyptian] society must be fixed," he said, according to MENA news agency. He directed his address to the young people who will take part in the government's newly launched Youth Leadership Programme, several of whom were in the audience. El-Sisi said that in the coming period, more national projects would be carried out. The country has been facing a number of domestic critics of its recent policies, including a recent decision by the government to recognise a Saudi Arabian claim to two Red Sea islands, Tiran and Sanafir. On Friday, protests took place in several cities against the decision, while a public campaign opposed to the deal has been launched by a number of politicians. In a televised speech Wednesday, El-Sisi also said that “evil” people in Egypt had spread lies about the murder of Italian student Giulio Regeni in Cairo. The lies, which the president did not detail, have been believed internationally and caused embarrassment and criticism of Egypt, he said. President Sisi needs to learn opposition to some of his policies and terrorists. He is correct about the hysterical media, but it exists, in part, due to his lack of communication with the people to explain his policies and the reasoning behind them. Sisi started his term with full support of the people but seems to have turned his back on the very people who wished him all the best. State institutions need to be reformed, corruption fought, human rights respected. His real allies are the people - not institutions that are protecting their interests above all else. He needs to build a 'Team Egypt' that can make every Egyptian feel a true part of his country. Citizens are not soldiers who should just follow orders. He needs to criticism as a thing given in good faith. He needs to listen to others than his 'loyalists'. INTERNAL incompetent police-state government worries us (Egyptians) more than EXTERNAL MB or ISIS terrorists. Distorted radical Islamist terrorists can hurt hundreds or even thousands of Egyptians, but incompetent police-state government hurts 90 million Egyptians, General Sisi. If there is any doubt ask your tourism minister and investment minister!